Since last summer I have been writing about the relentless upward creep of household consumption (and carbon footprint) with growing household income. The question that preoccupies me is this: can income and private consumption be decoupled? In my view this is one of the most important challenges for the SCORAI community: the researchers, activists and policy makers. In the August and September posts about the U.S. I saw merit in creating amenities-rich affordable housing communities in low-impact cities such as New York by way of co-operative ownership model. In the November and December posts I obsessed about re-framing the meaning of good life and being green in the post-soviet Europe, which in at least some cases seems intent on reproducing the Western model of social progress based on consumerism. And now I raise the urgency of my question by looking at China, with its 1.3 billion inhabitants aspiring to good life, and with an official government policy to increase domestic consumption. 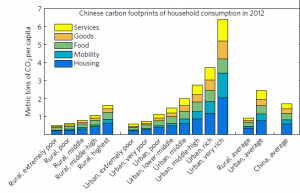 A few days ago, Dominik Wiedenhofer sent to the SCORAI listserv an article he co-authored (http://www.nature.com/nclimate/journal/v7/n1/full/nclimate3165.html) which shows carbon footprint of Chinese citizens as a function of income. Apart from having the absolute scale on the vertical axis about 6-7 times smaller than in the US (as well as differences in data collection and income metrics) this graph looks eerily similar to the US graph, published by Ummel in 2014 (http://www.cgdev.org/sites/default/files/who-pollutes-database-greenhouse-gas-footprint.pdf). 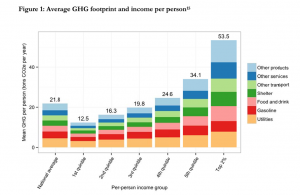 In the US the top 10% earners contribute 25% of greenhouse gas emissions from households while the bottom 40% of earners contribute 20% of emissions. In China, the top 10.6% of earners emits 19% of total while the bottom 47% emits 25% of total. The conclusion is rather straightforward: tell me your income or income category and I will tell you what your carbon footprint is (statistically speaking). There are two ways to look at these two graphs. One is to assume that all socioeconomic classes aspire to emulate the lifestyles of those above them in the income ladder, as is largely the case in consumer society, and view the consumption treadmill among the emerging global middle classes as inevitable, with all its social and ecological consequences. I choose a different perspective. This is an opportunity to figure out how to decouple household income from consumption. And I do not mean the debunked myth of decoupling growth from energy consumption through technology. I mean social and cultural change. With regard to moderately affluent families whose basic needs are met for housing, mobility, food, social identity and other essential amenities for a dignified life what kind of policies, campaigns, incentive and infrastructures will channel their growing income to non-consumerist pursuits of good life. There is a massive body of research literature, experience and tacit knowledge that can inform this type of inquiry. We just need to focus. Previous Previous post: Sustainable lifestyles worth holding on to.